In a diesel engine, the principal bearing & bushes are those which allow rotation of the crankshaft about its own longitudinal axis in the main engine entablature,and those between the connecting rod and crankshaft. 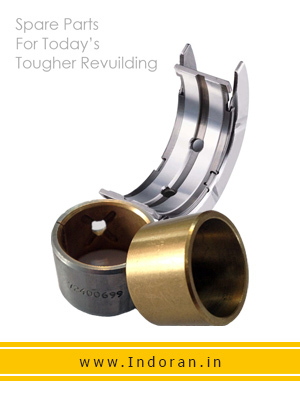 Usually bearing & bushes are manufactured keeping in mind the desired properties like wall thickness, interference fit, locating tangs, free spread, grooving configuration and clearance. To provide this features bearings are made up of white metals, copper-lead and bronze-lead alloys,aluminium-silicon alloys or aluminium-tin alloys which are overlaid with lead based coating to give wear resistance, fatigue strength and scuff resistance.